In some ways it’s almost the perfect Tie-In novel. It gives us stuff that the TV show never did and never could. It segues perfectly with everything we saw on screen and, as we read it, becomes kind of indispensible: I can’t picture those people without these histories now. 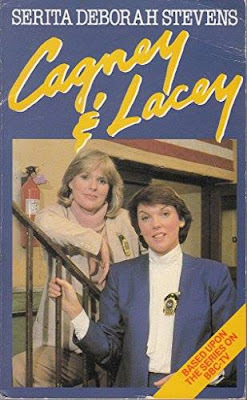 Serita Deborah Stevens’ 1985 novel, ‘Cagney and Lacey’ is one of those Tie-Ins that gives us the origin story of its protagonists, beginning two decades before the TV show ever did. It provides us with stories not necessarily too ‘broad and deep’ for TV, but too early and too youthful. There’s a special joy in getting to know the principal characters of Christine Cagney and Mary Beth Zmgrocki in their early years. In alternating chapters we meet very recognisable versions of the women we know from TV. Before their lives are twined together they are in very different circumstances: Chris having a high old time in Paris and then London in the Swinging Sixties as a society photographer; poor Mary Beth is struggling along as a secretary living alone with her ailing, abandoned mother. In some ways it’s a very simple story, leading us through the life changes that bring both women to enroll in the NYPD’s training program. We get set backs and triumphs, first and second loves, first collars… and we get smashing, snarky dialogue – especially when the two women are first assigned to the beat together and don’t particularly hit it off. There’s so much to love in this short, readable volume. I loved the scenes dealing with Mary Beth’s falling in love with Harvey – the much put-upon house-husband familiar from the show. When she first walks the beat with a nightstick and a gun she finds him tailing her in their car, trying to bring her coffee and a corned beef sandwich. It’s a very touching scene. I also really enjoyed the early scenes with Cagney in London, living in a kind of racy Danielle Steele novel, before what she decides she really wants is a Ed McBain kind of life. It’s a novel about back stories in which two women decide what kind of story they want to be living their adult lives inside and, what we get, by the end, is a rather gritty crime story involving hookers, pimps, concentration camp survivors, Nazis and diamonds. In fact, though some later chapters are based on early episodes it’s rather grittier in places than the TV show would get. By the very end, with the women’s promotion to detective status, and the shifting of their desk to the space beside the coffee pot, we dovetail neatly with the beginning of the TV show. It makes me rather sad that there were no print sequels from Stevens or anyone else. There were TV movies to tell us what became of Mary Beth and Christine in their later careers, but a TV movie isn’t quite the same as a novel. TV movies fly by so quickly and they don’t give you the dull little moments of downtime that novels do so well.